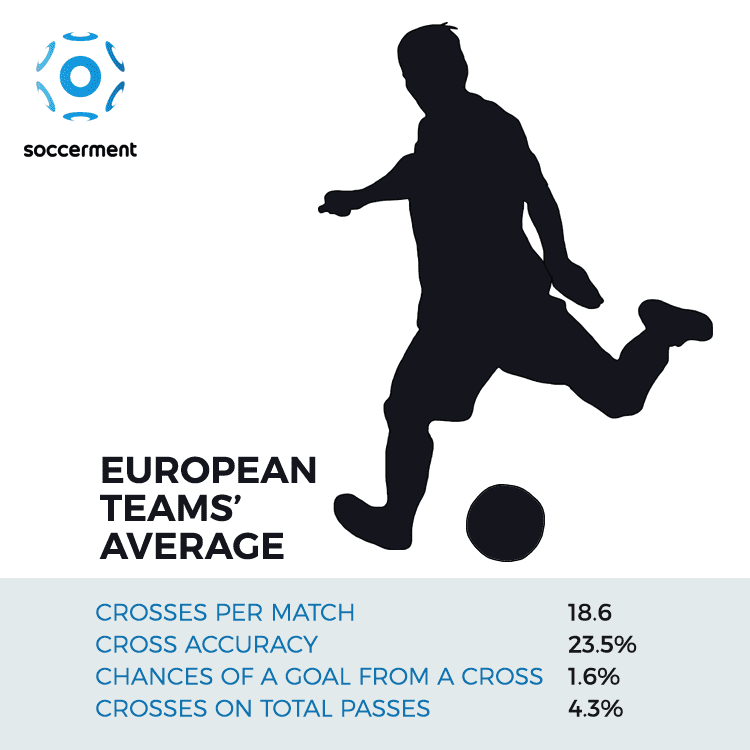 Crossing is still very much used by the top European teams (18.6 per match, on average). However, we doubt the efficiency of such an attacking strategy. 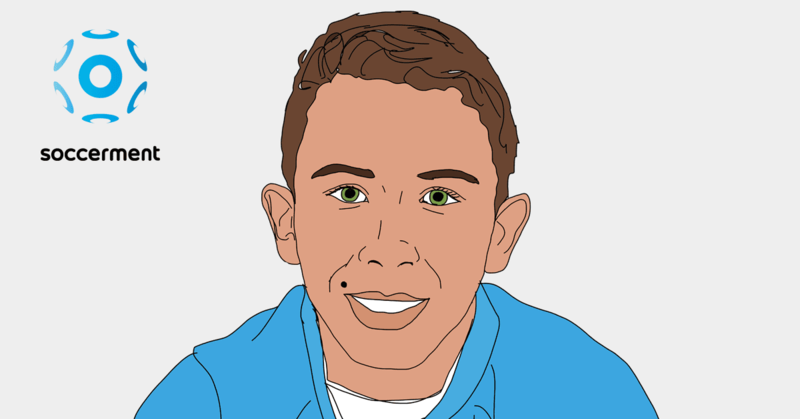 We calculate that only 1 every 64 crosses is directly translated into a goal. Is it worth trying? We conclude it is not, unless you have someone like Mauro Icardi, of course. 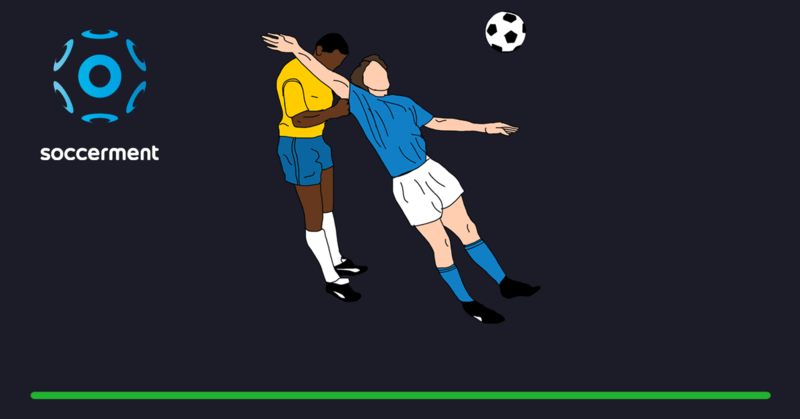 Our dataset comprises all the matches played so far this year in the five major European leagues: English Premier League (‘EPL’), Spanish La Liga (‘SLL’), Italian Serie A (‘ISA’), German Bundesliga (‘GB’) and French Ligue 1 (‘FL1’). A grand total of 98 teams. We define a cross as ‘an attempted/accurate pass from a wide position to a central attacking area’. Our database shows that the European teams are still very much into crossing: on average, a team crosses the ball 18.6 times per match. 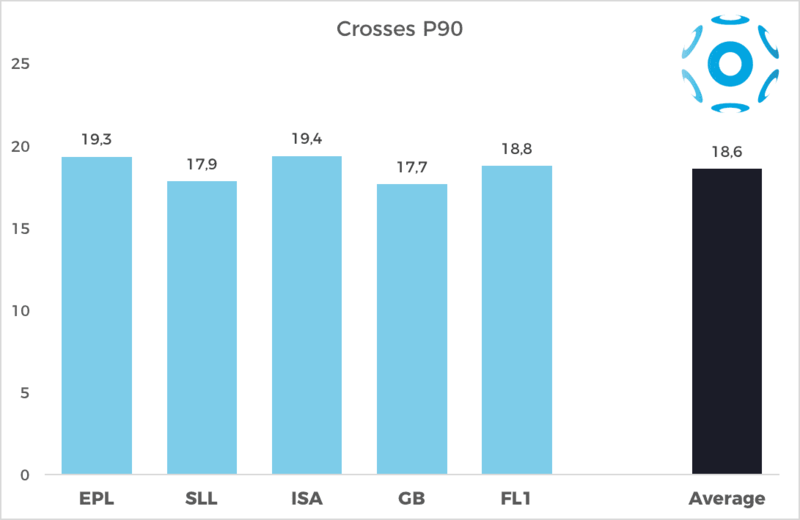 As shown by Chart 1, the ISA and the EPL are the leagues displaying the highest propensity for crossing (19.4 and 19.3 P90, respectively). Quite a lot of crosses, right? It must mean that crossing is deemed as a very effective attacking strategy, otherwise it wouldn’t be rationale pursuing it. Ahead of the decisive World-Cup-qualifier return match against Sweden, Italy’s coach Gian Piero Ventura certainly seemed to rely a lot on this attacking option. Despite our warning, he used a 3-5-2 formation, specifically designed to allow Candreva (on the wide right) and Darmian (on the wide left), to cross the ball as often as they could. They certainly adhered to the task: at the San Siro stadium, against Sweden, Italy put together 51 crosses in a single match. Quite an accomplishment. What Italy did not accomplish, however, was the qualification to the World Cup, as the team failed to score a single goal. Were the Italians just unlucky that night? Or, maybe, this strategy does not do well against very tall defenders (Lindelöf is 187cm tall, Granqvist 192cm)? There is a third option, in our view. Simply put, crossing might be – against common beliefs – a very inefficient strategy. Crossing is difficult. There are many physical and technical abilities required to consistently cross accurate balls in the box. Speed, stamina, dribbling, precision, tempo, to name a few. The crosser and the receiver also need a lot of coordination between the two of them. Not easy. 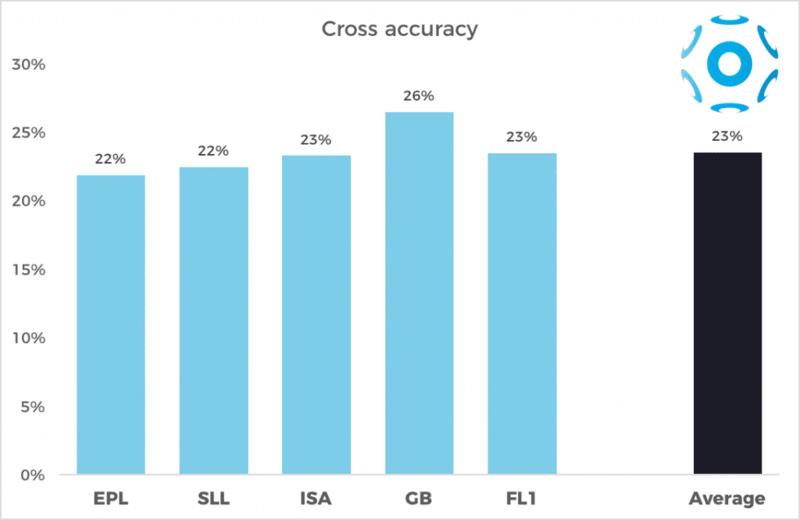 In the five top European leagues (mind that we are not talking about Sunday-league football), the average cross accuracy is 23.5% (the percentage of crosses actually delivered to a teammate). 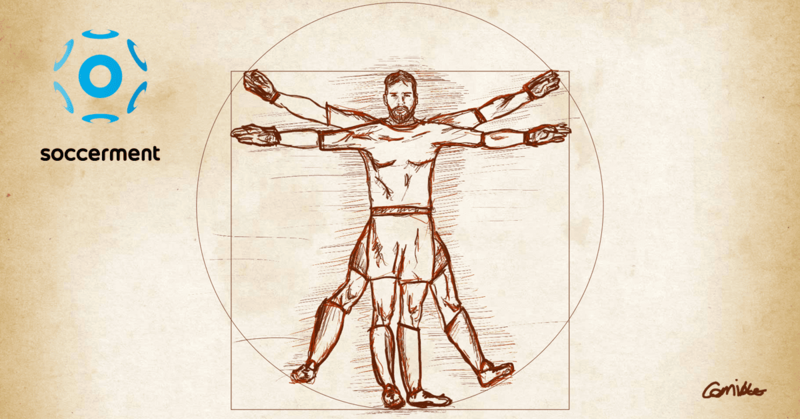 This means that more than 3 out of 4 crosses get lost (the ball is intercepted by an opponent, or goes out of the pitch). We notice a small difference across leagues, the only number standing out here, as shown in Chart 2, is the higher cross accuracy in the German Bundesliga (26.5%). Even when the ball is accurately crossed and directly goes to a teammate, the chances of scoring remain poor. 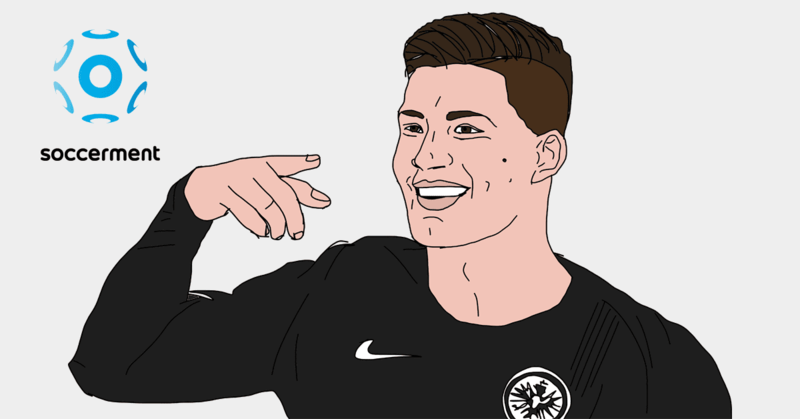 Volleys, headers, bicycle kicks, are generally selected as the top candidates for best-goal rankings at the end a season. The reason is that these goals are extremely difficult. And they are extremely rare. First of all, not every time a ball directly goes to a teammate, she/he is able to shoot. That happens slightly more than half of the times, 56% on average. Secondly, as aforementioned, scoring from a cross is tough and entails outperforming xG, as xG cannot be but low in these cases. 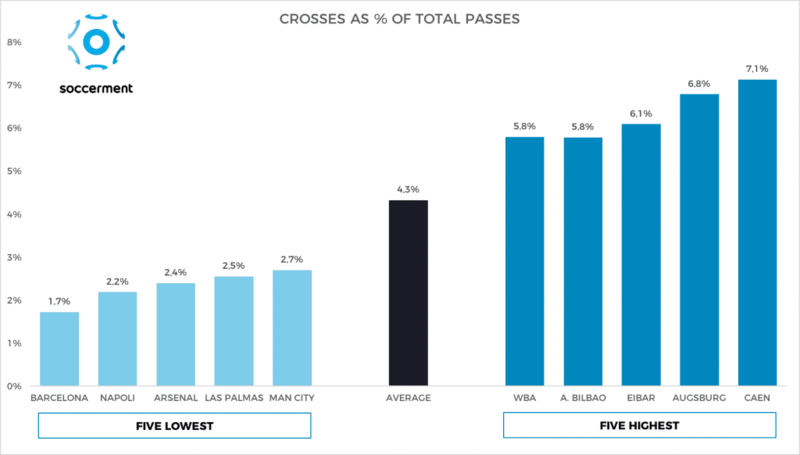 The percentage of key passes from crossing becoming assists (i.e. a goal) is 11.9% on average. We note this is well below the total percentage of goals from key passes (14.1%). PROBABILITY OF SCORING A GOAL FROM A CROSS [1.6%]. This means that, on average, it takes 64 crosses to score a goal. Obviously, from these stats we cannot extrapolate the number of times a goal is indirectly scored after cross, like after a failed clearance by the opponents. However, we are not sure this really matters. Our point is: should you really base your attacking strategy on exploiting the opponents’ defensive mistakes? What are the teams relying the least on crosses? Manchester City (EPL): 19.6 crosses per match, 2.7% of total passes. For these teams, the frequency of crosses is less than one every 37 passes (<2.7%). They average 2.1 goals per match and 2.2 points per match. What is Las Palmas doing there, with the teams supposed to play among the best football in Europe? Well, Pako Ayestarán’s side is known for favouring a passing game, which in our statistical exercise is key to display a low frequency of crosses. Their tactical decisions have, so far, pleased more the eye than the table ranking though, as they sit at the bottom of the SLL table. 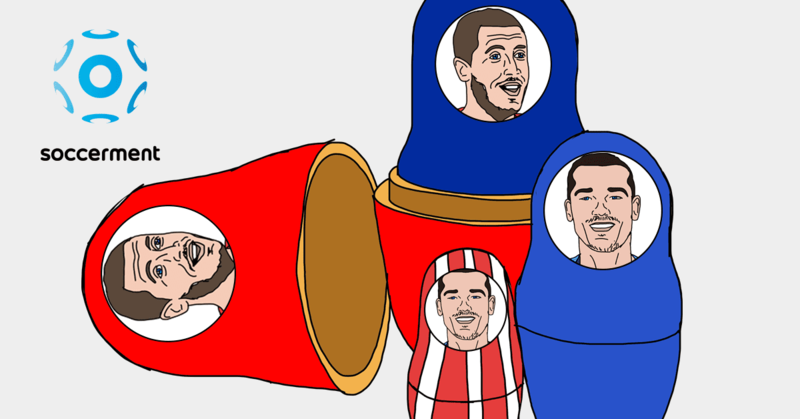 What are the teams relying the most on crosses? 5th: West Bromwich Albion (EPL): 18.5 crosses per match, 5.8% of total passes. These teams average 0.94 goals per match, 1.11 of points per match. What is their main reason for exploiting this strategy? 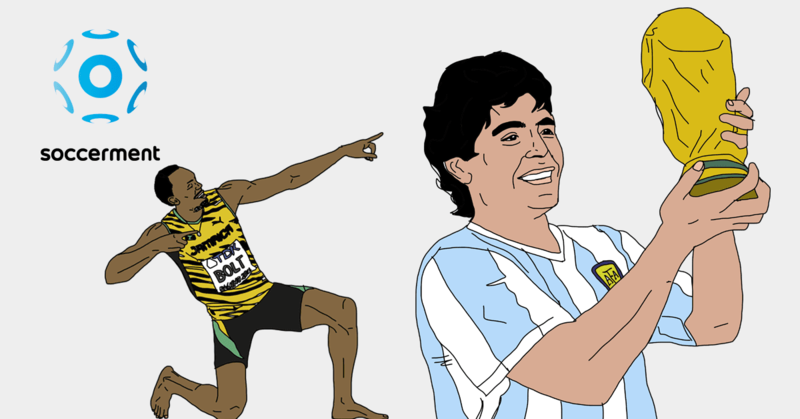 Basically, it is their forwards’ height. Take Caen for example, they mostly use a 4-4-2 tactical formation, playing Ronny Rodelin and Ivan Santini upfront. They are 192cm and 190cm tall, respectively. Inter Milan produce 25.1 crosses per match, the highest amount in the Italian Serie A (‘ISA’) and third-highest in Europe. More importantly, the number of crosses turning into a goal is 0.8 per game, the highest in all the five major European leagues. It comes down to two reasons: Inter’s tactical structure and their attacking players’ characteristics. 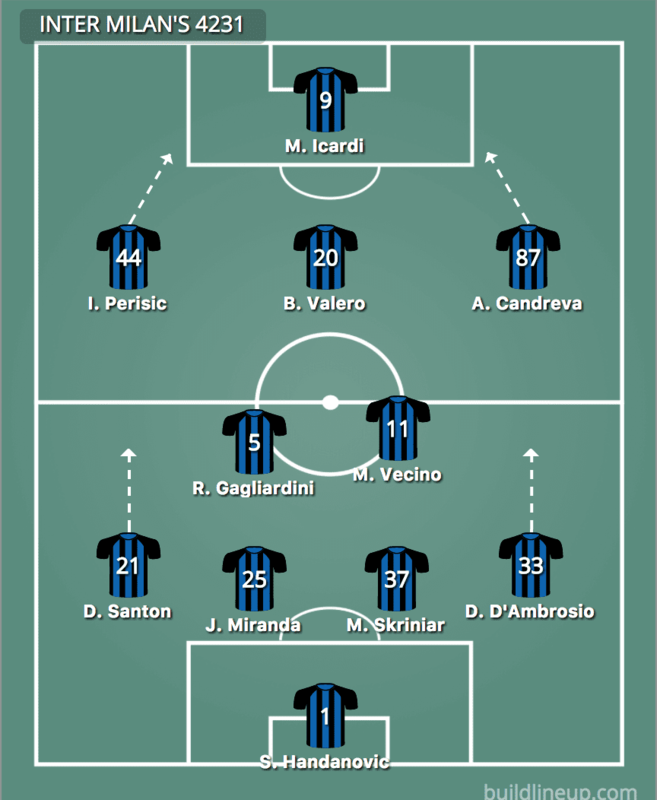 Luciano Spalletti designed Inter to play with a 4-2-3-1 formation. Upfront, Ivan Perisic and Antonio Candreva consistently provide their captain Mauro Icardi with a constant flow of balls in the box. We also highlight that the full-backs Danilo D’Ambrosio on the right and Yuto Nagatomo (or Davide Santon) on the left, often overlap to be ready to cross as well. Candreva crosses on average 11.7 times every 90 minutes and, on his own, accounts for 43% of Inter’s total crosses. 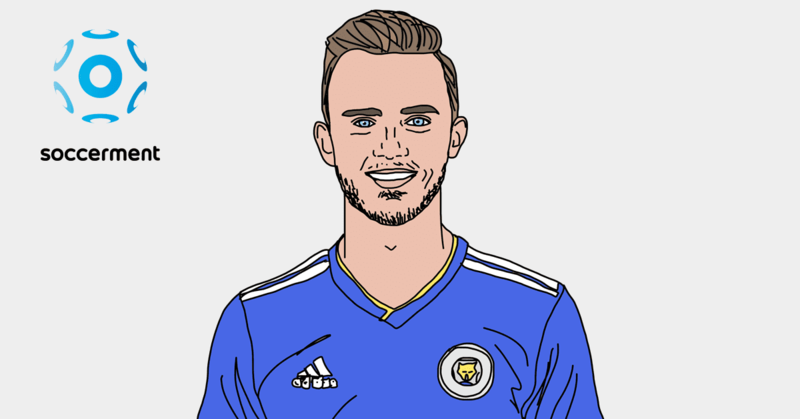 The quantity of his crosses offsets a below-average cross accuracy, of 22.1%. Furthermore, both Candreva and Perisic have a higher-than-average translation of accurate crosses into key passes: basically, when a ball is accurately crossed by one of them, it has a high probability of being shot by a teammate: 63% for Candreva, 80% in the case of Perisic. The main reason for this, in our view, relates to the crosses’ receiver: Mauro Icardi. Inter Milan’s captain Mauro Icardi has so far scored 15 goals in 14 matches, in the Italian Serie A. We notice that 20% of his goals where scored through headers. What really stands out among Icardi’s stats this year is his shot-accuracy: 61.2%, among the highest in Europe. Furthermore, his total goal conversion is outstandingly high at 30.6% (15 goals out of 49 shots in total). 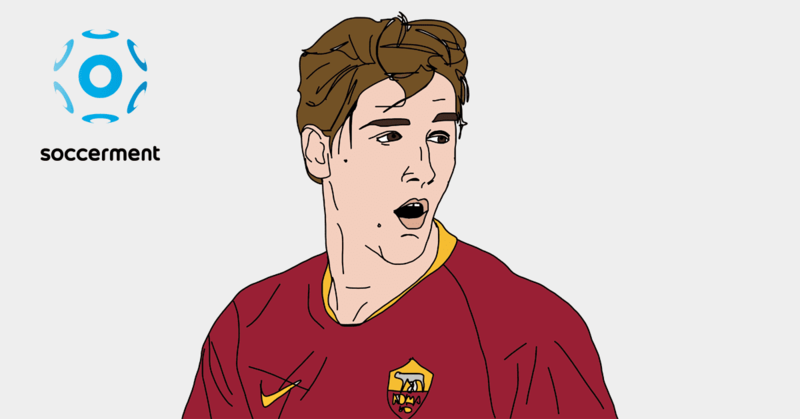 In open play, it is still impressively high, at 27.0%. 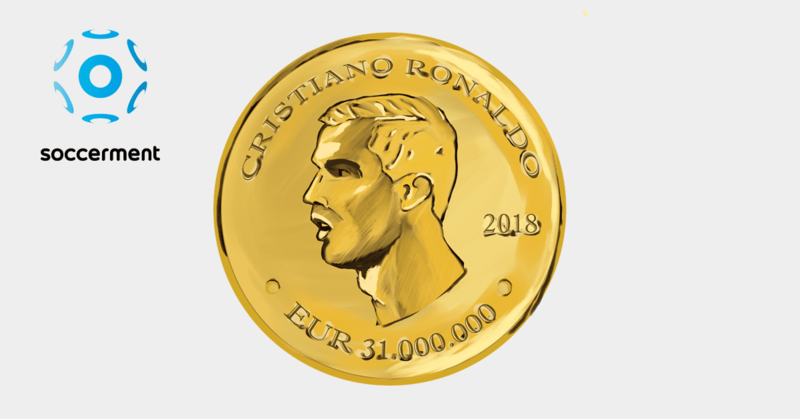 Credit: We gathered all the data for this post from WhoScored.com. For any comment, suggestion or query, do not hesitate to send us an email: research@soccerment.com.